Could drinking with dinner every night impact your mental health? Alcohol is quite an integral, accepted part of our culture. It is considered sociable and ‘normal’ to have a drink with dinner or while relaxing in front of the television, every evening after a long, stressful day working, parenting or whatever your daily grind involves. It gives you that immediate sense of being relaxed and calm. One drink often leads to another and before you know it, the bottle of wine is empty. It is easy to overshoot the recommended weekly allowance of alcohol for men and women of 14 units. Can drinking daily with dinner be bad for you? Yes. This sustained level of alcohol intake can have a significant effect on our mental health, even if you are not binge-drinking on a regular basis. Alcohol can in fact trigger anxiety and depression because of its detrimental effect on our brain’s chemical activity. Taking a drink to help calm the nerves can lead you in to a vicious cycle of heightened anxiety and alcohol intake and so it is really important to try to avoid going down this path. Alcohol interferes with the neurotransmitters in your brain. These are the chemicals that transfer messages from one nerve to another. They are dependent on a status quo within the brain for proper functioning. When this balance is disrupted by this chemical change, there may be a resultant initial calm feeling and what is essentially a false sense of wellbeing. Alcohol suppresses the area of the brain responsible for inhibitions, making people feel more confident and relaxed. Fluctuations in mood can occur as alcohol lowers serotonin levels in our brain. Serotonin is a hormone which helps regulate our mood, levels of which tend to be lower in people with depression. If you are prone to stress or anxiety, alcohol intake can be particularly harmful, in that it is a known depressive, often escalating symptoms of depression or anxiety. The link between the two is well documented. Those with mental health problems are more likely to drink alcohol, in a self-medication type effort while those who drink alcohol regularly are more at risk of developing mental health issues. The greater amounts of alcohol you consume, particularly as you near bedtime, the greater negative impact there is on your sleep. Alcohol interferes with our sleep pattern, suppressing melatonin levels. Melatonin helps regulate the sleep/wake cycle or our ‘circadian rhythm’. REM sleep is compromised, limiting how refreshed and clear thinking you are, come the morning. You are not your sharpest and it can often be a foggy start to the day, ultimately affecting mood and performance. Sub-optimal sleep can have a significantly negative impact on our ability to manage anxiety and stress levels. Start an exercise routine. Well known to have a very positive impact on mental health, boosting serotonin levels, reducing stress levels, anxiety and helping to improve your mood. The hardest part is getting a regular routine started. Coming in to the dark winter months, the last thing you want to do when you get home is to trek off out to a class or the gym. But I would suggest taking your gym gear with you to work and heading straight there. Once you get in to an exercise routine, you will absolutely realise the mental as well as the physical benefits. Go for walks. Rather than sitting on the couch with a bottle of wine, catching up, grab your friend or partner and your trainers and get a good long walk in instead, be it city or country. This is ultimately more refreshing, energetic, satisfying and good for you. Take up a relaxing physical activity. Yoga, Meditation, Pilates all have great relaxation properties and when practised regularly can have very positive results for the mind and body. There are lots of evening classes all over – dancing classes are sociable as well as great physical activity! Attend alcohol free events. London is great for late evening events, that do not have to centre around alcohol – Late museum and gallery openings etc. Arrange an alcohol-free evening – I think you will often find that people are very happy to participate. 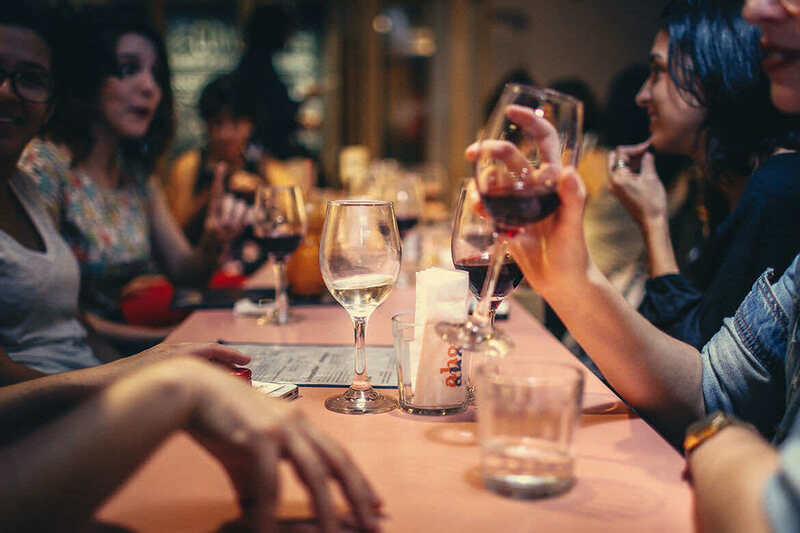 A recently formed movement ‘Sober and Social’ facilitates great alcohol-free social events where you can meet like-minded people. Do something for yourself or others. Distract yourself by finding a new hobby and get involved in an evening course in something you are interested in. Cooking and mindless TV or movie watching are popular choices too! Or consider volunteering in a local charity in the evenings – it’s good for the mind and the soul. If you feel that your alcohol intake is becoming problematic and having a negative impact on your day to day life, work, relationships and general health, or if those close to you have expressed concern about your levels of alcohol consumption, it may be time to talk to a professional, such as your GP, about this. It can be challenging to get yourself out of a spiral of drinking without professional help and advice. There are lots of resources out there.